Mitral regurgitation, in the acute and chronic decompensated states, is commonly encountered in the emergency department. An understanding of the underlying etiologies and pathophysiology of the condition is critical to direct appropriate treatment. Mitral regurgitation can be divided into the following 3 stages: acute, chronic compensated, and chronic decompensated. In the acute stage, which usually occurs with a spontaneous chordae tendineae or papillary muscle rupture secondary to myocardial infarction, a sudden volume overload occurs on an unprepared left ventricle and left atrium. The volume overload on the left ventricle increases left ventricular stroke work. Increased left ventricular filling pressures, combined with the transfer of blood from the left ventricle to the left atrium during systole, results in elevated left atrial pressures. This increased pressure is transmitted to the lungs resulting in acute pulmonary edema and dyspnea. If the patient tolerates the acute phase, the chronic compensated phase begins. The chronic compensated phase results in eccentric left ventricular hypertrophy. The combination of increased preload and hypertrophy produces increased end-diastolic volumes, which, over time, result in left ventricular muscle dysfunction. This muscle dysfunction impairs the emptying of the ventricle during systole. Therefore, regurgitant volume and left atrial pressures increase, leading to pulmonary congestion. 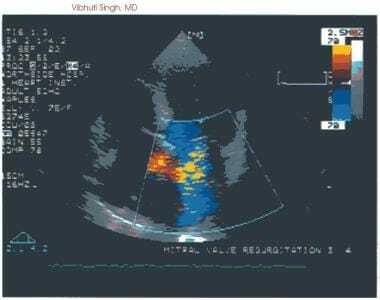 Severe mitral regurgitation as depicted with color Doppler echocardiography. Previously, chronic rheumatic heart disease was the most common cause of acquired mitral valve disease in the Western world. More recently, however, mitral valve prolapse (MVP) has become the most common cause, being responsible for 45% of cases of mitral regurgitation. MVP has been estimated to be present in 4% of the population; however, significant regurgitation in this population only occurs in those with abnormalities of the valve. In areas other than the Western world, rheumatic heart disease remains the leading cause of mitral regurgitation. The prognosis of patients with mitral regurgitation depends on the underlying etiologies and the state of the left ventricular function. The extent of left ventricular dysfunction from underlying ischemia is the primary prognostic determinant in those with regurgitation secondary to coronary artery disease (CAD). Acute pulmonary edema and cardiogenic shock often complicate the course of acute regurgitation. The operative mortality in these cases approaches 80%. A patient with ruptured chordae tendineae and minimal symptoms has a much better prognosis. With chronic regurgitation, volume overload is tolerated very well for years before symptoms of failure develop. Left atrial enlargement predisposes patients to the onset of atrial fibrillation with the subsequent complication of embolization. In addition, these patients are susceptible to endocarditis. A study of the survival of patients with chronic regurgitation was performed using randomly selected patients. The study revealed that 80% of the patients were alive 5 years later, and 60% were alive after 10 years. Most patients with mitral valve prolapse are asymptomatic. Prolapse in those older than 60 years is frequently associated with chest pain, arrhythmias, and heart failure. The prognosis of these patients is good; however, sudden death, endocarditis, and progressive regurgitation occur rarely. When ischemic heart disease is the mechanism for regurgitation, the extent of anatomic disease and left ventricular performance are prognostic determinants. Complicating events include sudden death and myocardial infarction. Patients with acute mitral regurgitation secondary to infarction emergently requiring valve replacement have a 60-80% mortality rate if they present with severe pulmonary edema. Sudden death, ruptured chordae tendineae, and endocarditis remain infrequent complications of regurgitation secondary to long-standing mitral prolapse. In those younger than 20 years, males are affected more often than females. In those older than 20 years, no sexual predilection exists. Males older than 50 years are affected more severely. Of those cases caused by prior rheumatic disease, the mean age is 36, plus or minus 6 years. [Guideline] Bonow RO, Carabello BA, Chatterjee K, de Leon AC Jr, Faxon DP, Freed MD, et al. 2008 focused update incorporated into the ACC/AHA 2006 guidelines for the management of patients with valvular heart disease: a report of the American College of Cardiology/American Heart Association Task Force on Practice Guidelines (Writing Committee to revise the 1998 guidelines for the management of patients with valvular heart disease). Endorsed by the Society of Cardiovascular Anesthesiologists, Society for Cardiovascular Angiography and Interventions, and Society of Thoracic Surgeons. J Am Coll Cardiol. 2008 Sep 23. 52(13):e1-142. [Medline]. [Full Text]. Borer JS, Bonow RO. Contemporary approach to aortic and mitral regurgitation. Circulation. 2003 Nov 18. 108(20):2432-8. [Medline]. Carabello BA. Management of valvular regurgitation. Curr Opin Cardiol. 1995 Mar. 10(2):124-7. [Medline]. Carabello BA. Mitral valve disease. Curr Probl Cardiol. 1993 Jul. 18(7):423-78. [Medline]. Fenster MS, Feldman MD. Mitral regurgitation: an overview. Curr Probl Cardiol. 1995 Apr. 20(4):193-280. [Medline]. Filsoufi F, Salzberg SP, Adams DH. Current management of ischemic mitral regurgitation. Mt Sinai J Med. 2005 Mar. 72(2):105-15. [Medline]. Gaasch WH, Eisenhauer AC. The management of mitral valve disease. Curr Opin Cardiol. 1996 Mar. 11(2):114-9. [Medline]. Schon HR. Medical treatment of chronic valvular regurgitation. J Heart Valve Dis. 1995 Oct. 4 Suppl 2:S170-4. [Medline]. Wisenbaugh T. Mitral valve disease. Curr Opin Cardiol. 1994 Mar. 9(2):146-51. [Medline]. Zito C, Manganaro R, Khandheria B, et al. Usefulness of left atrial reservoir size and left ventricular untwisting rate for predicting outcome in primary mitral regurgitation. Am J Cardiol. 2015 Oct 15. 116(8):1237-44. [Medline]. Arsalan M, Squiers JJ, DiMaio JM, Mack MJ. Catheter-based or surgical repair of the highest risk secondary mitral regurgitation patients. Ann Cardiothorac Surg. 2015 May. 4(3):278-83. [Medline]. Four-chamber apical view of a 2-dimensional transthoracic echocardiogram demonstrates mitral valve prolapse (MVP), a common cause of mitral regurgitation.